Mass Effect: Andromeda has an open world, but what do you actually do in it? If Mass Effect: Andromeda follows the usual BioWare template it will have a pressing central narrative many of us will completely ignore for tens of hours at a time as we track down and tick off every side quest so we arrive at the final confrontation 20 levels above the recommendation. 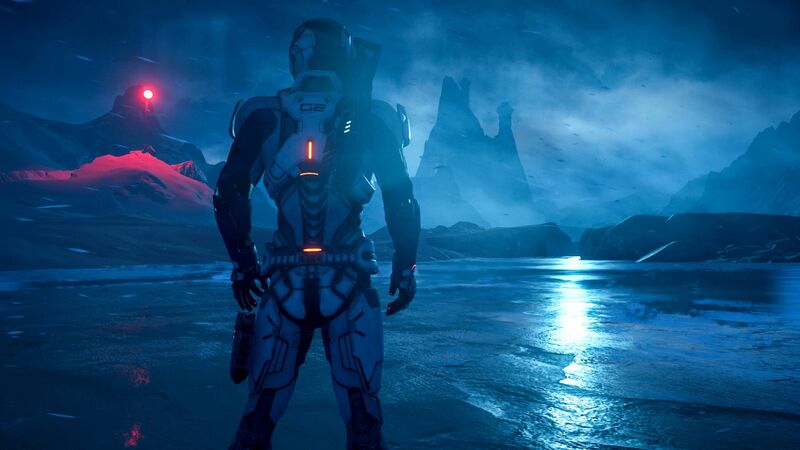 The latest Mass Effect: Andromeda info drop from GameInformer details some of the side content available to those who wander off the main path, which in my opinion ranges from “heck yeah” to “gentle sobbing“. Starting with the highlight, Mass Effect: Andromeda does bring back loyalty missions. According to the article, these side missions will foreground individual characters in a way not seen elsewhere in the game, and tell different kinds of stories than the main plot allows for. Moreover, they’ll lead you to new destinations you might otherwise never see. When you arrive on a new planet in Mass Effect: Andromeda, you have the opportunity to clear out hostile enemies, laying siege to bases to undermine their power. Apparently most planets will have “at least one” base, and taking them out rewards the player with “some worthwhile items”. Taking out bases is a “lengthy” process and although it’s optional it usually plays into a storyline; it sounds like there may be a stealth element, too, since you end up with alarms ringing if you “tip off” too many enemies. Other side content includes tracking down drop zones, which sounds very similar to Dragon Age: Inquisition’s camps; scanning stuff to unlock codec entries and crafting recipes; tackling optional fights, many of which will be too tough the first time you encounter them; and driving around in the Nomad. Some of the things you’ll find in Mass Effect: Andromeda’s open world will be marked as waypoints, while others will only be found by leaving the roads and roaming around. Does this information fuel or defray your Mass Effect: Andromeda hype?